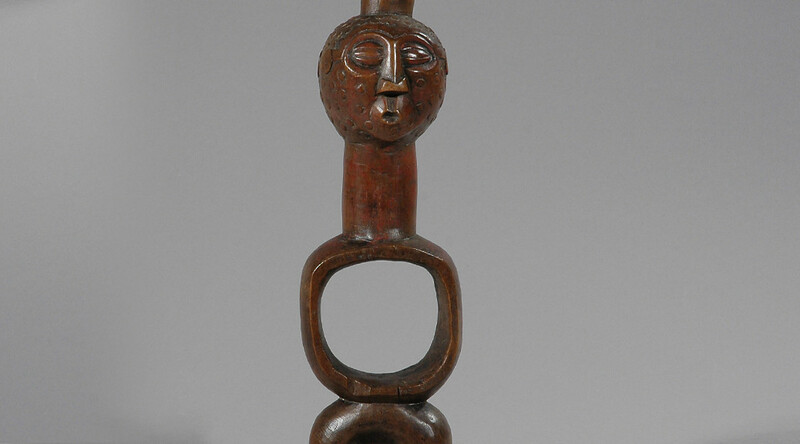 Boyo communities within the Democratic Republic of Congo are renowned for their series of majestic royal ancestral representations. 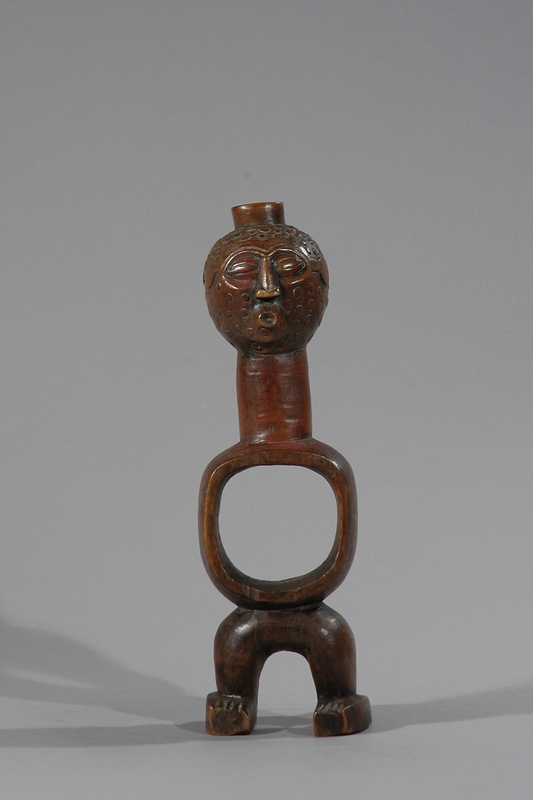 This figure is said to memorialize Akessa, grandson of a chief who migrated north to the current location of the Boyo peoples. It is a classic example of Boyo commemorative representations in which distinguished leaders are depicted simultaneously as serenely introspective and as an awesome, otherworldly physical presence. 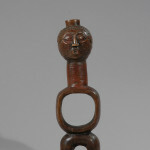 The prominence of the large and bulging closed eyes refers to the subject’s status as a being endowed with a heightened sense of the spiritual realm. The massive spheres of the head and abdomen are kept in balance by the still tension of the arms and shoulders, which create an overall rectilinear contour to the figure. 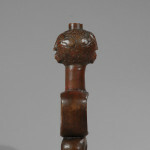 The surface of the figure is decorated with the incised patterns and ridges of the coiffure, beard, eyebrows, and bracelets. In addition, a dense inscribed motif of bold concentric circles covers the chest and extends across the shoulders to the length of the back. 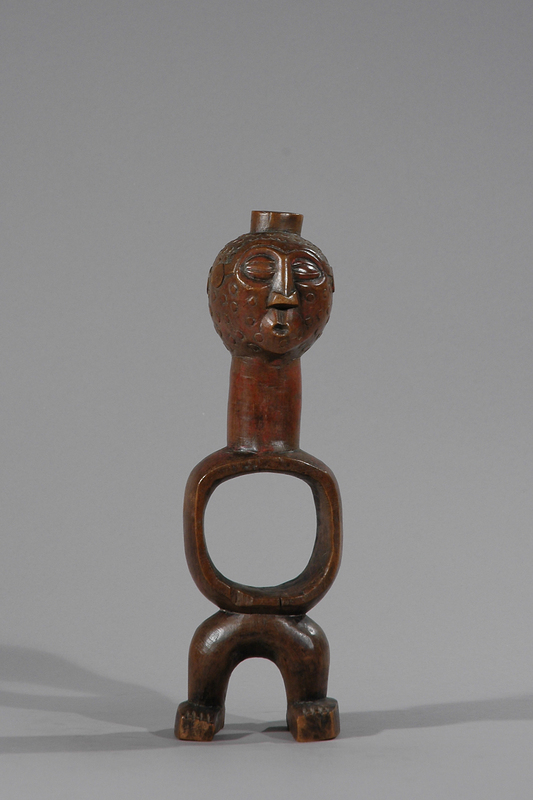 Works such as this were once combined in ancestral ensembles comprising four to seven figures wrapped in textiles fastened around their shoulders and lower body. 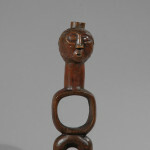 Individual sculptures were named after the particular ancestors they evoked. It seems that the largest and most impressive of the works in a particular group was invariably also the oldest, depicting a founding ancestor. That sculpture, it has been suggested, served as the model or prototype for the others, which represented successive generations of chiefs. The successive works added to the ensemble were sometimes by the same hand, but usually more than one sculptor was responsible for their execution. 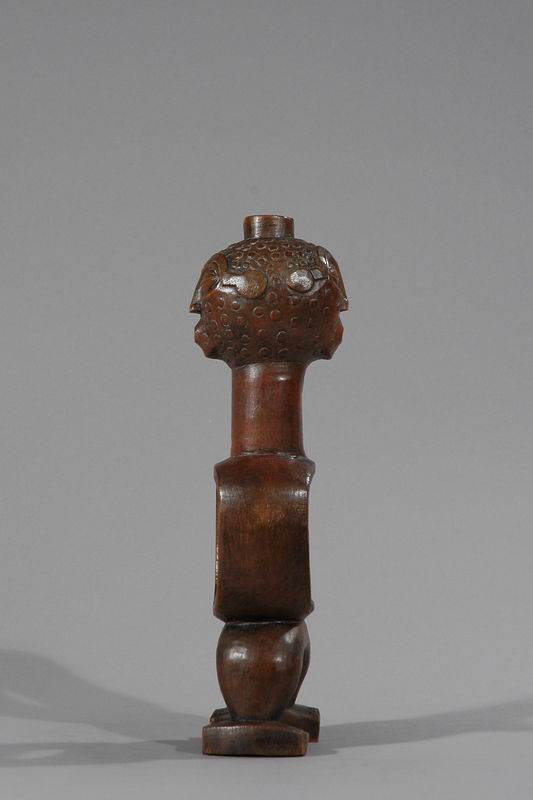 Stylistic features such as coiffure and posture further differentiated both sculptures and sculptors. Unlike portraiture, which seeks a certain specificity, this tradition of commemorative representation recasts contemporary leaders in the highly idealized, abstract idiom of their forebears. By preserving and perpetuating an artistic approach associated with the origins of the community, contemporary generations built a powerful bridge to the past. Boyo communities are a complex blend of regional peoples and cultural identities. 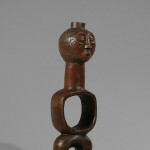 The extensive cultural interaction that underlies their heritage has led to some dispute regarding the definition and place of Boyo sculptural traditions within the broader context of the region’s art history. 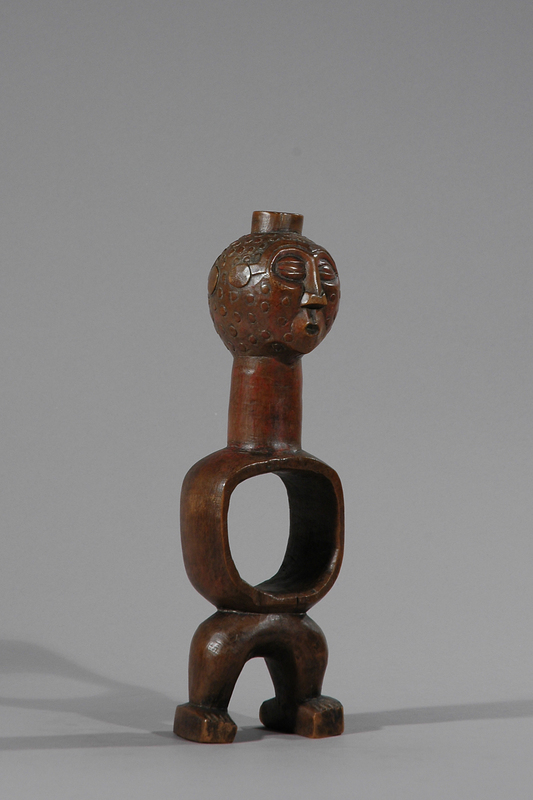 Because parallels can be drawn with artwork from the nearby Tumbwe, Tabwa, and Hemba peoples, some scholars theorize that Boyo sculptures served an important role as the basis for related sculptural traditions in the region.